In our second to last blog post, “Not Just Rustic Style: Designing Your Furniture”, we talked about the style variations we have encountered (and what we can offer) when it comes to our customers’ furniture design. One part we did mention is the overall “transitional” style. A key aspect we briefly touched on was the mixing of wood and metal to craft different furniture. It is safe to say that we are known best for our solid wood tables, and with good reason. Our general production is hardwood, handcrafted tables. Something to remember when starting your journey to find perfectly crafted custom furniture is there are many, many choices to create your ideal piece(s). One option when working with us is adding metal to the mix of design. So, although we are skilled woodworkers, we also know how to create with metal. 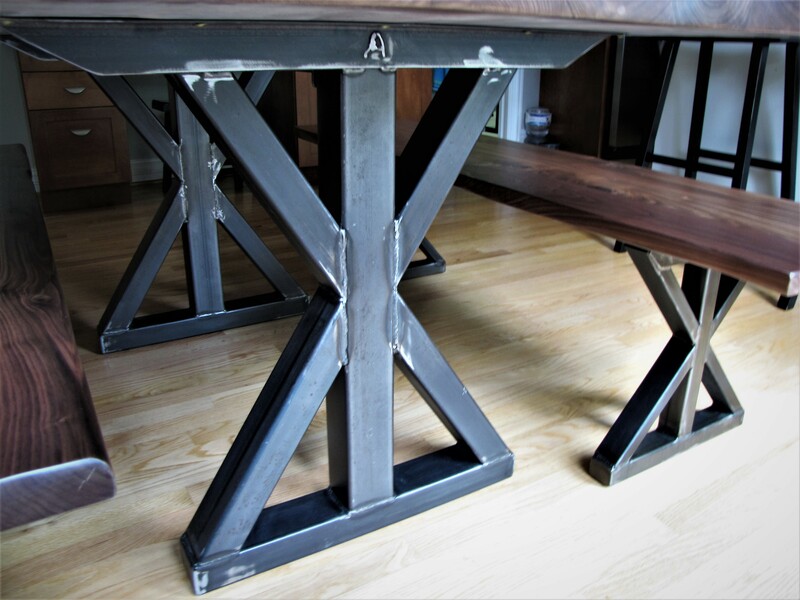 Read on to learn more about our extended love for metal and how we use it to build our customers’ furniture. It should come as no surprise that metal is a strong and resilient element. So much so, that we frequently use it as a base to hold up some of our hefty wooden tops. It is trusted to be durable and withstand what everyday life can throw at it. Take a look at our walnut slab table we built. The slab is one solid cut piece and tips the scales. It is massive in comparison to the metal arched base that sits under it. Not only is the completed table trendy and transitional, it is durable and easy to live with. Our round tables have increasingly gained popularity. 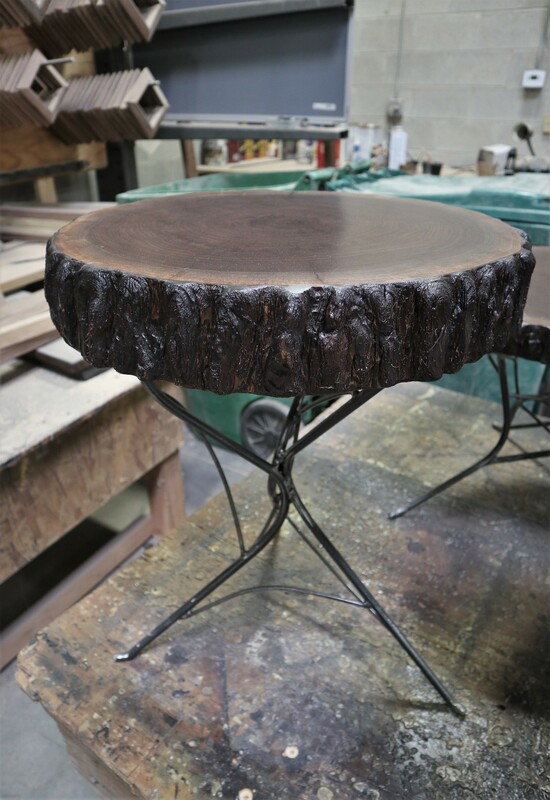 We recently delivered this round table which features both a metal apron AND a metal base. Which leads to our next point, metal is not exclusively used for bases, nor does it have to have the typical steel look. Like the metal apron that was added to that custom round table, we can add hints of metal in other areas besides bases. Check out this coffee table on our showroom floor. Attached around the edge of the top portion are little metal, detailed studs. We also built metal rods to the side of this bookcase for a local library. Fun fact: the ‘Book Sale’ sign is courtesy of us! Two different, and custom, ways to mix wood and metal. If you are looking to add some flair to your handmade piece, we also offer the option to powder coat many of our metal designs. Just like the gold under that first-mentioned round table, some color on your furniture can draw in the eye. Going back to bases, this Crescent pedestal ba se is actually solid metal AND powder coated in a silver tone per our customer’s requests. The table is a conversational piece for many different reasons, but the base’s silver gives that pop that we know their guests will be talking about. Gold and silver are just two of the many color offerings customers can choose from. To browse the catalog and see the plethora of different hues, click here. The ability to design your own custom furniture means plenty of styles and elements to work with. 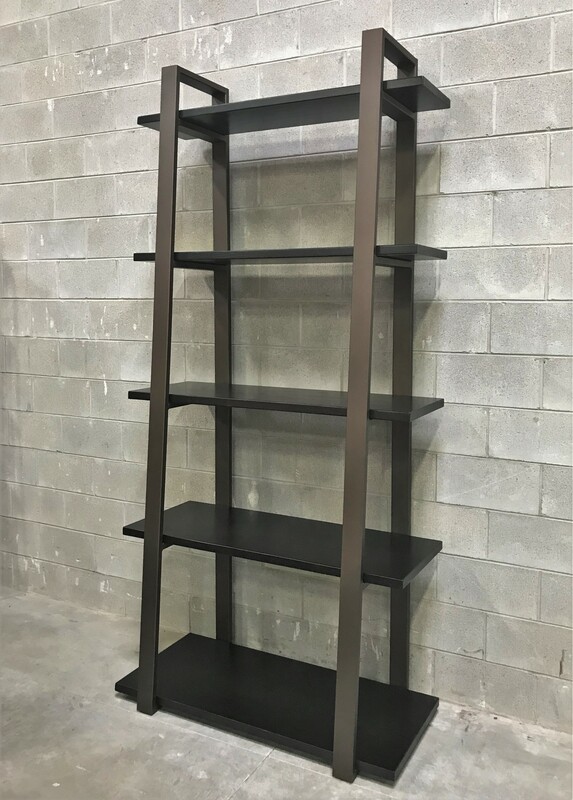 We hope briefly touching on some of our metal options to build with has given you peace of mind that we are multifaceted and ready to take on any ideas for future furniture that may come to mind. To get started on creating your own custom furniture, reach out to us here. We will get back to you as quickly as possible. While waiting, check out some of our previous work we have done here. Keep in mind each piece of furniture was built after establishing a relationship with our customer and therefore each piece is as unique as them. Whether you are interested in our woodwork, metalwork, or anything in between, we really look forward to working with you!